The Carpetbag Brigade adds a jungian twist with a dash of PTSD to Jack and the Beanstalk. YOU DON’T KNOW JACK is the surreal tragic comedy of an alcoholic dead man and the shadow of his wild dysfunctional family. Inspired by Robert Bly’s The Sibling Society, this funny nightmarish fairy tale excavates the echo of trauma created by the casual and constant contact soldiers have with war. Young Jack grows up in a world overshadowed by the ghosts of his grandfather’s death from alcohol and war-induced Post-Traumatic Stress Disorder. Trying to make sense of a mother who sings disturbing lullabies, teachers who eat children and a puzzling world of contradictory voices and dreams emerging from the grave, Jack plunges into a parallel inner world. Here, amidst a crew of grotesque characters shipwrecked between myth and reality, for whom life is a struggle not to become monsters, Jack penetrates the upside-down fairy–tale world enveloping him. 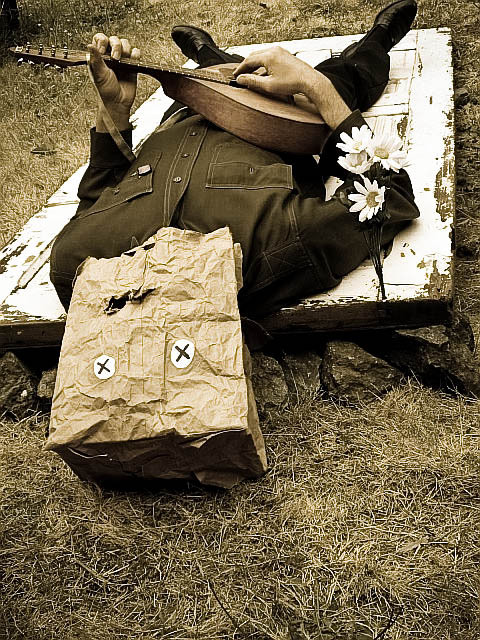 With original and traditional music played live onstage by the performers and a rich tapestry of objects and poetry, YOU DON’T KNOW JACK is a theatrical response to the moral and emotional wars that soldiers return home with. It invites us to dig in the dirt of our own imaginations and plant new seeds, stories and songs. The cast created actions, songs, texts and dances individually. The story of Jack and the Beanstalk wound itself onto the framework of our creative material with the assistance of inspiration from The Sibling Society by Robert Bly. The story crawled like a vine through our creative process and became the scaffold upon which we organized our actions and interactions. The characters of Jack began to emerge and live their present day story set amongst a domestic milieu of postwar trauma, alcoholism and emotional disturbance. Self-devised theater work requires a vigilant attention to detail and a dedication to searching out the nuances of a discovered story. It is rare for a theater company to return to a performance and continue to work on its details over three years. Commitment to that kind of aesthetic maturation runs counter to the dynamics of consumer culture capitalism. The process creating “You don’t know Jack” is also rare in that it has had two directors. Jay Ruby was the conceptual director of the performance and birthed it while performing in it as an actor. Editing Director, Varrick Grimes of Toronto, Canada, offered to guide the piece into adulthood after seeing it in the summer of 2008. The two had worked together before in carpetbag productions and shared a similar vocabulary and theatrical ethics inherited from Grimes’ work with Canada’s Primus and Number 11 theater and Ruby’s studies with Denmark’s Odin Teatret. Every Friday in the lead up to the Iraq War in 2003, there was a protest in downtown Prescott around the courthouse plaza. There were women in black, there were the anti-war protesters with their signs; there were the pro-war protesters with their signs. The Carpetbag Brigade and friends dressed in white and painted themselves in white clay in honor of those who have died. We danced silently through the protests, walking to both sides of the street and inviting the voices of the dead to be heard and witnessed. Flowers of Deliverance evolved from these acts of protest. In one poignant moment the women in black were on one corner being berated by a pro-war supporter. As we crossed the street in our slow timeless improvised dance, he turned around and began to walk across the street. He was suddenly caught in a world between black and white that was witnessing him in the middle of the street. It was poetic metaphor in action. Flowers of Deliverance emanates that type of transformational situation into performance, where internal dichotomies are transcended through expression. In January of 2003 we did an intensive retreat with Mexican Butoh dancer Diego Pinon. The information and experiences from that workshop deeply influenced the structure and intent of the Flowers of Deliverance performances. They were a mix of choreography and improvisation with the intent to reach express the body in a deeply altered state. A local band, Bueno a.k.a. All-Autonomy rehearsed with us and created live music for the performances. The shows were never the same and the energy was cathartic and explosive. We were shedding our skins and shattering our shells. A Prospector’s Dream looks at the memories of Ophelia Taylor, a well-to-do girl with good prospects, who arrives from the East to live with her father, the owner of the town’s mines. Circumstances within the town frontier brothel atmosphere lead her to a broken heart and a suicide. Her ghost is searching for the causes of her life’s fragmentation and a deeper understanding of the web of social dynamics that entangled the town. The performance is a journey through her memories; whose integration permits her soul to rest. It is a commentary on the forces that shape the relations of men and women on the frontier; and it is an attempt to intuitively document history that is not recorded. 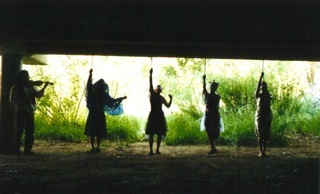 This site-specific outdoor performance utilized character and dramaturgy to devise a performance underneath a railroad trestle. It was there that a creek, a road, and the railroad provided a backdrop for our inspiration. 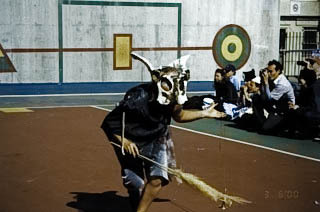 The performance began with the site and its natural, historical, and commercial intersections. The consequence of this choice was to discover stories and characters rooted in the time of the West when the railroads arrived. The Carpetbag Brigade collected fragments of dances and character sketches and wove a thread of a story that accumulated more and more meaning through improvisation. 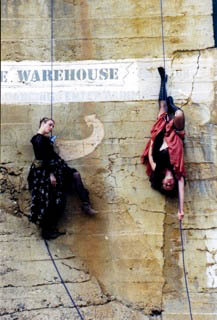 It became crystallized into a text-oriented drama that had moments of aerial dance and stiltwalking whose spectacle nature always supported the story line of the performance. A Prospector’s Dream was created in a six month performance laboratory with members of The Carpetbag Brigade. Special retreats were held in Jerome, Arizona and Anson Smith was the dramaturgical consultant. A Prospector’s Dream was produced by the Flourish Before the Flood component of Tsunami on the Square. One can romanticize nature and fill it with stories of magic and fairies. Our natural landscape is home to more than any one of us can ever know. In choosing to create a performance along Granite Creek in downtown Prescott we understood we would explore a hidden landscape where riparia meets the aspirations and detritus of the human condition. In searching for an aesthetic to combine ourselves and this area we came upon its residents – the falling branches, the garter snakes, the crayfish, the swaying grasses, the broken concrete, the people strolling through the shade and the people dwelling in the shadows. Perhaps the wounds of the landscape attract the wounds of our culture. Perhaps along the creekside banks scattered like plastic bags and glass bottles are stories of the forgotten, the wounded, the unique and the beloved. One can pick up the glass and plastic, but what of the invisible stories and secret memories residing along the creek? The Evolution of Simple Being was a skitmercial for the Tsunami on the Square Festival. Skitmercials are live advertisements for sponsors of the festival. New Frontiers, an organic food store, had just offered to become a major sponsor for Tsunami on the Square. The Evolution of Simple Being is a skitmercial for humanity promoting awareness of the basic needs our world requires to survive. It tracks a masked character through the travails of daily existence and honors the struggle to have basic necessities of life – clean air, clean water, clean energy, procreative space and clean food. Using agit-prop techniques and game show host gimmickry this performance integrated political commentary into the supporting of the festival sponsor. It was an infomercial that got 3,000 people to cheer for solar power, clean water, and organic food while integrating cultural spoofs of The Price is Right, Rod Stewart, and Star Trek. Tsunami on the Square had a skitmercial crew each year directed by Jay Ruby. It composed between 20 and 25 skitmercials as in-between acts for the festival. The skitmercial crew took a month of sporadic and intense rehearsals to put together the skitmercials. Bring forth the spilled guts of American culture and place them before divinatory visitors from a parallel universe. Family pattern and the obsession with transcendent mysticism create an uncertain wedding and birth. The entrails reveal to us an existence more beautiful and complex than any previously known. Haruspex is a stillborn performance, tapping into the depths of the psyche without making sense of it. Archetypes of omniscience attempt to cultivate meaning from ancient signals and conjure up the recurrence of the family shadow. The Carpetbag Brigade’s 3rd outdoor performance suspends itself between dance and theater with character and their relations searching for a context to exist in. Color and chaos combined to create an animated state of existence preoccupied with occult. This performance was another project with Prescott College students mentoring with Jay Ruby. It was created over a three week intensive training seminar and used diverse modalities of creation. It existed as an experiment in collective creation. As a performance it never experienced reaching its zenith. Many of the creative processes did not get a chance to reach fruition. Do you remember when you did not want to grow up?Rocking Horse Lullabye examined the imaginary mind of a young girl in an asylum. What lives below the surface of our sanity? The audience witnessed her desires and fears in the characters that played in her mind. The performance began with research on fairy tales and ended up in an asylum, with the fragments of a psyche dancing and speaking their own particular logics and influences. The intent evolved not into telling a fairy tale but invoking the state of protective imagination that we seek to filter and color or world with. In a given circumstance that may be preferable to reality. Do you remember when your inner world was more precious than your identity? What unspoken stories do we transmit through generations? 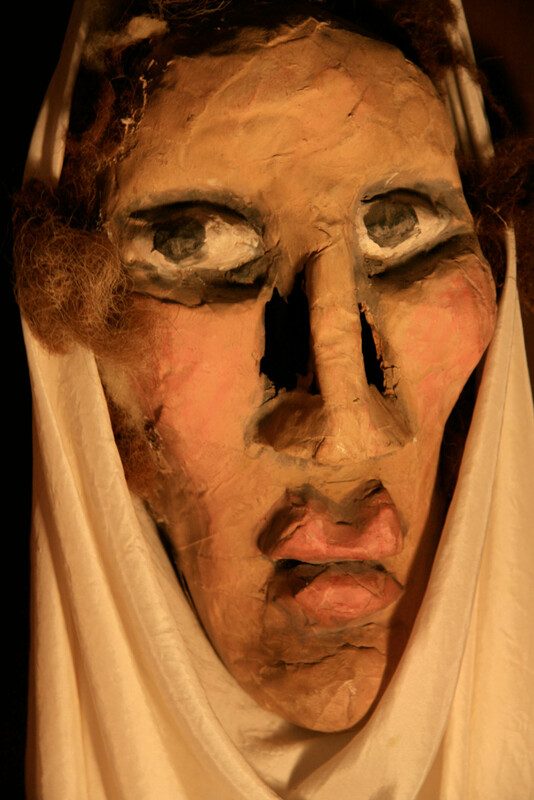 The setting for Rocking Horse Lullabye was in a young girl’s mind, in her room, in an asylum. It was for an audience of 16 spectators, who surrounded the performance space in a box shape. The actors performed in and around the space and did so every Sunday for 6 weeks. The performance was created over a five week intensive at Parmingus Studio in Jerome, Arizona where the actors lived together and trained together daily. The actors were all Prescott College students under mentorship from Jay Ruby. Tragedy Magnate Ha-Ha recounts the journey of the Ship of Fools through the archipelago of addictions. The Captain, The Sailor, The Siren, and The Beast plod their way through islands, addictions, and illusions. This performance from The Carpetbag Brigade was inspired by Sebastian Brant’s late fifteenth century book The Ship of Fools. It used texts about water and melodies from sea shanties to create a poetic sketch of archetypal characters lost at sea in the fog of their addictions. The 3rd performance from The Carpetbag Brigade started with character sketches based on Cupid, Cleopatra, the Minotaur, and Charles Darwin. The crew of the captain, sailor, siren and beast sailed to each island of their addictions and confronted the only way out…the future. Facing existential angst they huddled with each other in face of anxiety, death, and recognition of self. A mocking tale of sugar and religion looked at history’s tradition of individual alienation and the laughing ghosts of the sea. Tragedy Magnate Ha-Ha was created over a four month period in conjunction with independent studies from Prescott College students. It was developed as an outdoor performance but was better suited to stage presentations. Jay Ruby was the mentor for the other students who were college students taking the class as an independent study. Golden Marshmellow Oh Yeah is a nineties slacker’s version of the King Midas tale. Serpent Angels from the Garden of Eden sneak Eve out and set her up with King Midas. Golden Marshmellow Oh Yeah is a deconstructed soapbox oratory on the futility of greed. With crow calls, trumpets, featherdusters, marshmallows, and a bucket full of golden bones this theater piece created an audience in the street to display its parable on human folly. Arriving from distant corners the actors converged with their props to dance, sing and speak a treatise on the sins of money and touch. 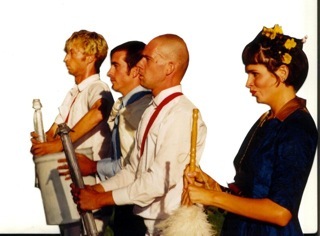 The 2nd performance from The Carpetbag Brigade included new female cast member Jill Roberts. The self devised process of collective creation was stewarded by Jay Ruby. The actors marched using symbols and code into the space and created a visual spectacle which was followed by a cascade of actions leading into a story. A subtle balance between confusion and clarity was invoked to keep the audience’s attention. Characters and stories emerged through a surreal twilight atmosphere. Psychic intimacy, shared silence and released laughter ornament the threads of this performance’s tension. Golden Marshmellow Oh-Yeah was an outdoor theater performance created over a four month time with an intensive retreat at the end. 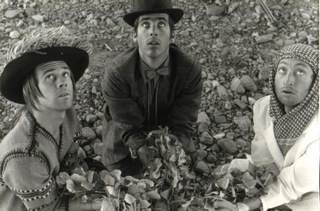 The four actors exchanged ideas and artistic concepts for improvisation and composition to create the performance which used diverse sources for text. The Pearl is a story about fathers, sons and the power of illusion. It evolved from a short story within the novel “The Magus”, by John Fowles. A wandering minstrel under a bridge told a tale from the Gnostic texts. Embellishments were drawn from Italo Calvino’s “Invisible Cities” and the poems of Rumi. Creeping blind behind The Pearl on two’s three’s and four’s is Oedipus and his lingering shadow on boys becoming men. The initial performance from the Carpetbag Brigade, then called The Carpetbag Brothers, combined a solo performance “Crumbdreams” from Jay Ruby with a story performed by Jay Ruby and David Cornell Campbell about a magician who hides islands, princesses and god from his son. Will Duncan provided music and musings from Rumi and the Gnostic texts. The end result was a one hour performance full of song, poetry and actions that evoked the contradictions of growing up and discovering that a father’s word was not final. The Pearl was an indoor theater performance conceived and created collectively over a four month period of time. The three performers trained together regularly in addition to rehearsing to create the performance.